Maniratnam's spellbinding romantic flick OK Kanmani has already created waves among audiences, in fact mesmerised everyone in the town as well as in the industry with teaser and trailer of the movie. 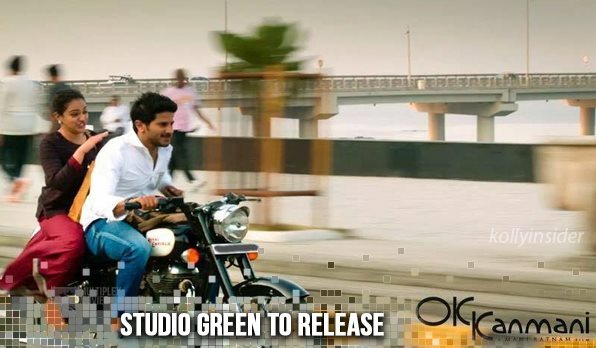 The trailer of the movie, which features lead actors Dulquer Salmaan and Nithya Menen in the lead, crossed 1 million views within a day of its release. While these fascinating things were happening, there was yet surprising news last night that Studio Green has acquired the Tamil Nadu theatrical rights of this flick and the deal has been officially signed as well. The film stars Dulquer Salman and Nithya Menen in lead roles, who have already worked together in films like Ustad Hotel and Bangalore Days. The film’s audio would be launched by the middle of this month followed by theatrical release in April. It is noteworthy that Studio Green has already acquired the Tamil Nadu theatrical rights of Sivakarthikeyan’s Rajini Murugan, produced by Thirrupathi Brothers.